Secretaries, in any organization, play a pivotal role. 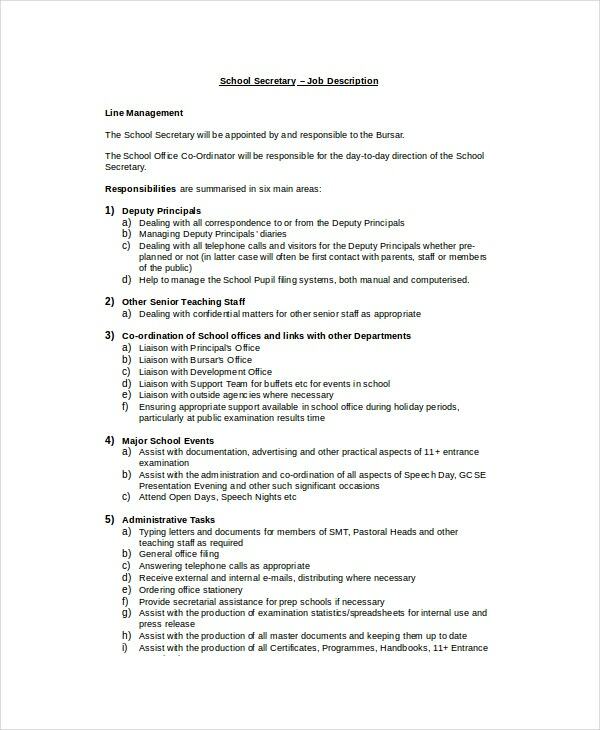 They perform a variety of administrative as well as coordinative duties. Secretaries assist the heads of institutions and enterprises with their agility and expertise. 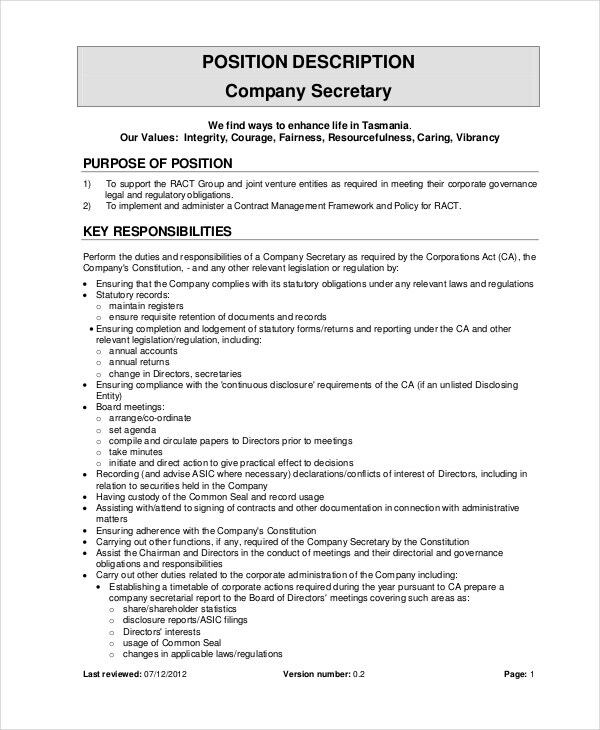 If you are looking out for an appropriate Secretary Job Description, you need to select a particular category first. There are different Job Descriptions ranging from business firms to educational institutions. 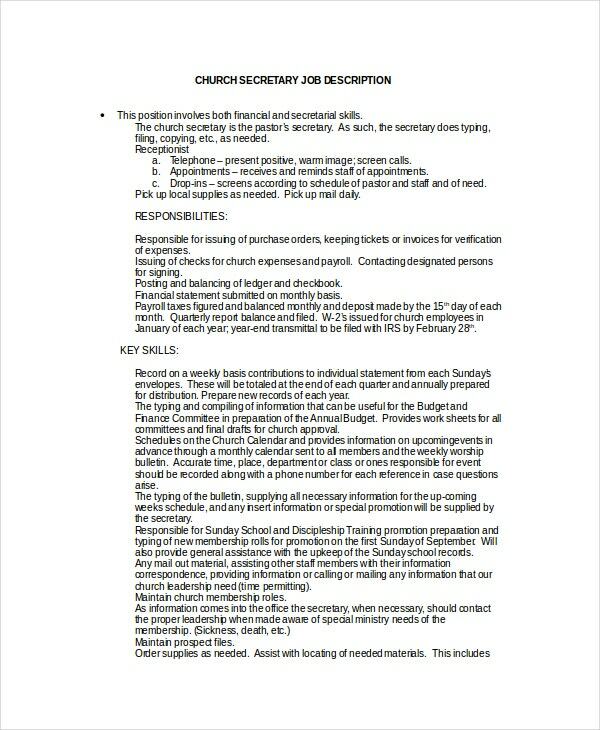 Given below is a collection of Secretary Job Description Example templates. The primary role of a litigation legal secretary is to provide direct secretarial and administrative support to legal advisers to help them out with client calls, client visits, and correspondence in a way that promotes the images and ethos of the legal firm. 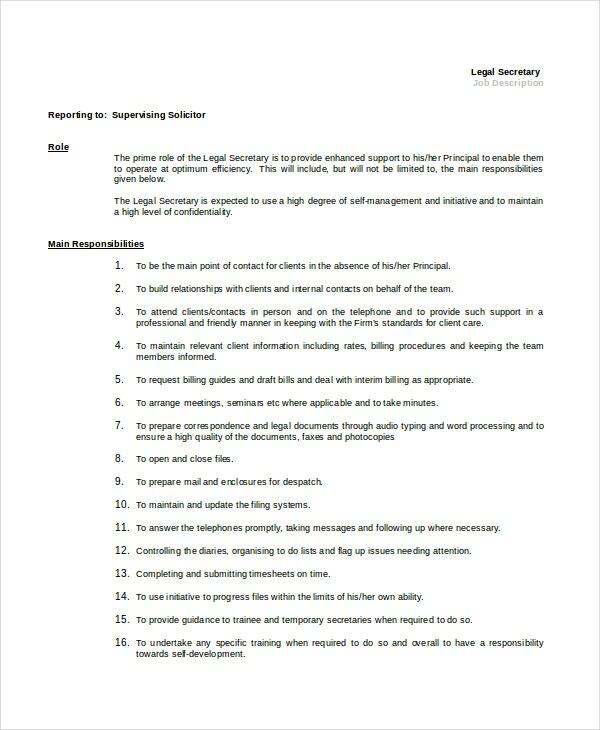 The Litigation Legal Secretary Job Description template offers a details job description. A medical office secretary must provide general and secretarial support to the clinical and management teams. 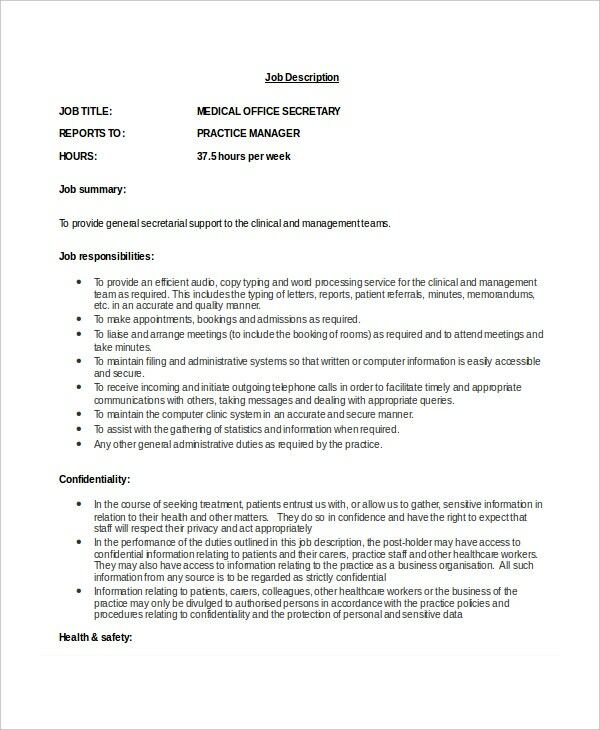 Download this Medical Office Secretary Job Description template for a better clarity and understanding of the job role. You can also see Medical Assistant Job Description templates. The prime role of a legal secretary is to provide an enhanced support to his/her legal advisor so that they can operate at optimum efficiency. 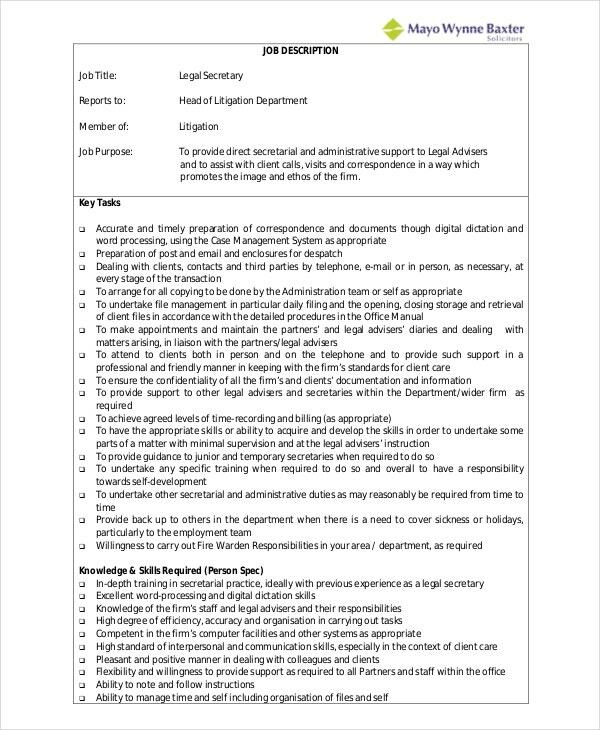 If you are looking forward to working as a legal secretary, this is an ideal job description template for you. A board secretary plays the role of a secretary of the board of directors and performs a variety of functions. 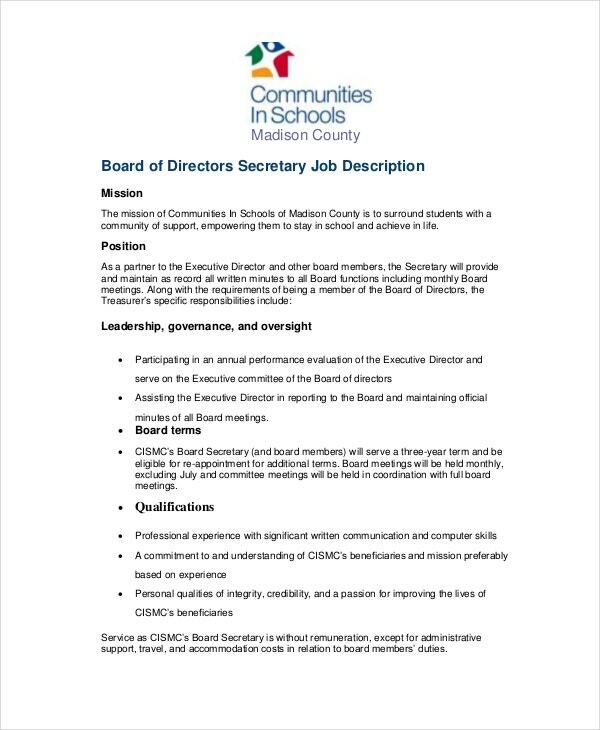 The Board Secretary Job Description template will give you a detailed description of the various roles and responsibilities that a board secretary performs. You can also check Office Assistant Job Description templates. > What are the uses of the Secretary Job Description Templates? Secretary Job Description Templates are used abundantly by various companies who are looking to hire eligible candidates with the required qualification and skill set for the post of secretary. A secretary in an organization is required to perform various crucial tasks. And these job description templates help the companies to lay out the entire set of responsibilities on their online platforms to advertise vacancies as it is essential to specify the exact duties of the profile. Moreover, the roles and responsibilities of a secretary vary from organization to organization. So, it is very critical on the part of the organization to include the specific responsibilities in details so that there won’t be any dispute regarding the same. You can also check the Human Resource Job Description template. 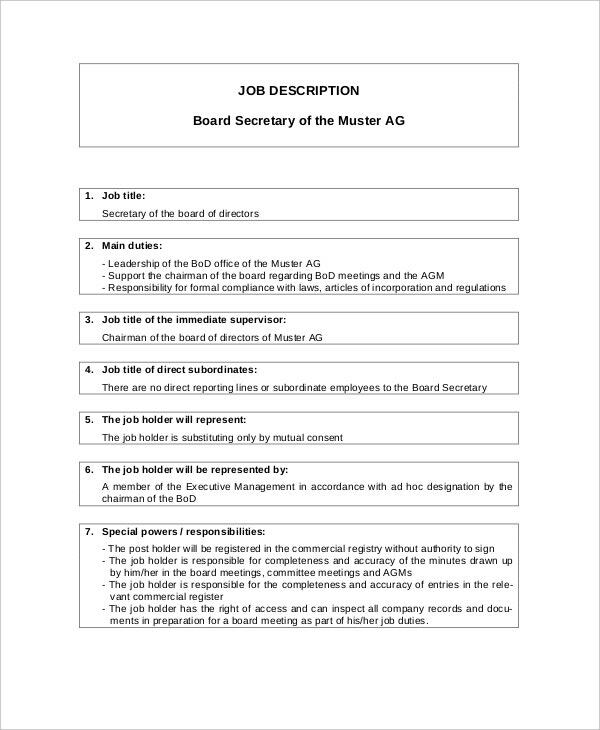 Board Of Directors Secretary Job Description template will give you further clarity on the role of a board of directors secretary. 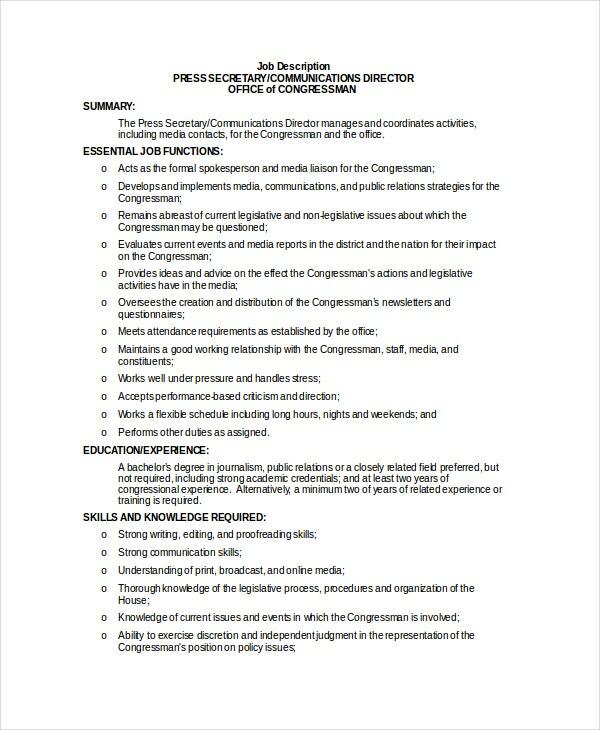 If you are looking for a job description for the board of director secretary position, this is an ideal template for you. > What is the information that should be Included in a Secretary Job Description Template? A secretary job description should include all the relevant information about the job role and the various roles and responsibilities that the candidate needs to carry out. A secretary in an organization plays a vital role in the smooth running of the company’s administration, and he/she is expected to be excellent at employee management. The secretary acts as an interface among various platforms like customers, investors, and vendors. So all these features must be included in the job description for the benefit of both the candidate as well as the company. A clearly described job description would help all the aspiring candidates to prepare themselves for the role in the most appropriate manner. 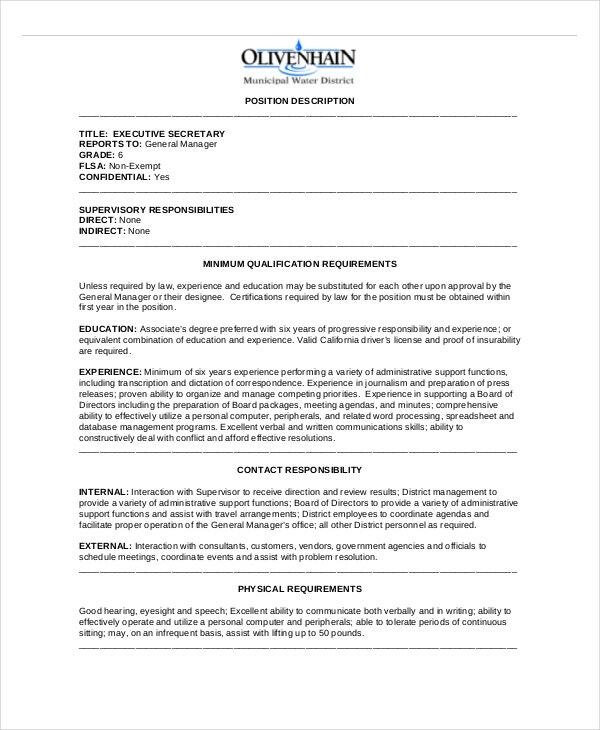 You can also see Legal Assistant Job Description templates. We have a vast collection of Secretary Job Description templates that you should go through. These will give you a better understanding of the various roles and responsibilities that a secretary is needed to perform. 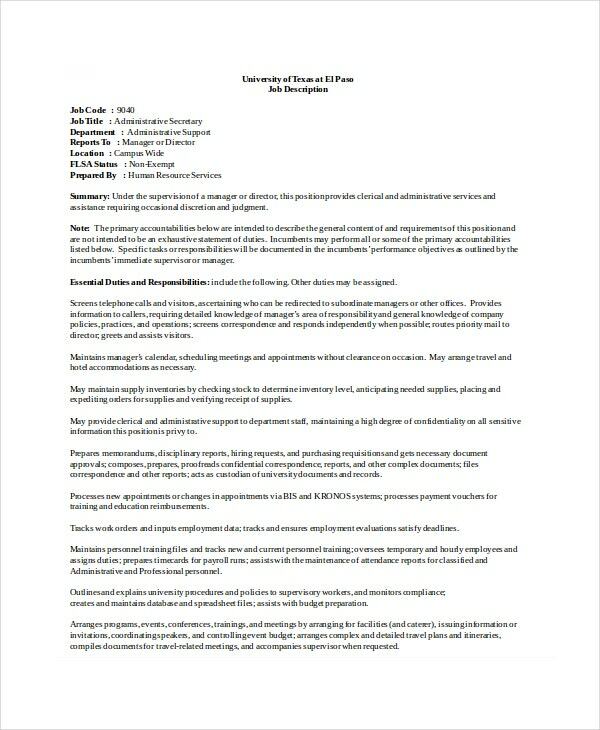 If you are looking forward to joining an organization as a secretary, these job description templates will be immensely beneficial for you.